Thoroughly analyze business processes before implementation. Modify the internal procedures. Simplify the flow as much as possible. Select a project manager inside the company, who will work with a consultant and drive the implementation. Construct the project plan, which will serve as a guide throughout the rest of the project. Work out various designs and configurations for the new system, define roles, and document standard procedures. Introduce the employees to what an ERP is, how the organization can benefit from an ERP and how each of them can contribute to successful implementation of ERP. Identify and empower curious employees who are enthusiastic about the change. 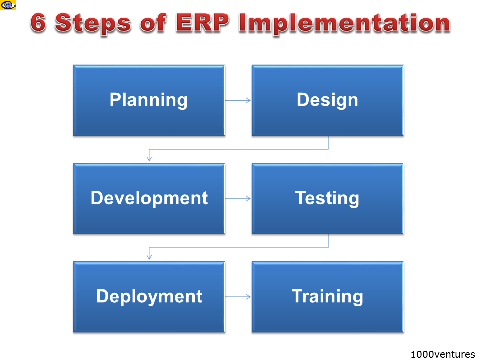 Carefully prepare the data (remove anything unnecessary, correct mistakes) before importing them into the ERP. Do a lot of testing before the new system goes live. Once the ERP system has gone live, analyze user feedback and make adjustments and changes to the system configuration as necessary.